This little place is the actual definition of “hole-in-the-wall.” You literally walk in, order, get your stuff, and leave. With that being said though, they’re doing a pretty damn good job with their 'Q. The exterior crust of the ribs comes crisp and the meat on the inside is perfectly tender, exactly the way that you’d expect a rib to be. This little South Minneapolis rib shack is a “true” hole-in-the-wall, in that it’s take-out only, but the ribs are totally worth it. 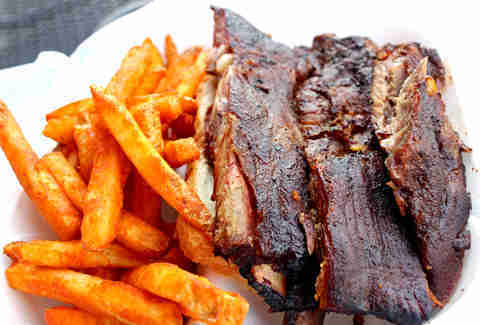 The smoky bark on the ribs is almost reminiscent of jerky, yet the fatty, porky meat underneath is a true treat. 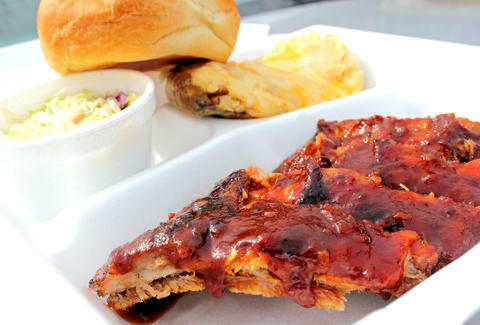 Give the ribs a little dunk in their slightly sweet, slightly spicy, slightly acidic BBQ sauce for a little extra something something. While some may criticize our pick on this one based on the fact that you can buy their sauce in grocery stores, these dudes still boast some darn tasty ribs. They’re marinated in a rub for 48 hours before getting the low and slow pit smoke. After that, they’re finished off on the grill and served with a ton of BBQ sauce, which makes for one great rack. This place is all about pork. Their large tender ribs are marinated for 24 hours and then slow smoked and finished on a grill over live coals right to the point where they give just a little when you pry the meat from the bones. Also, everything is served on a brown school lunch tray, which is pretty fun. 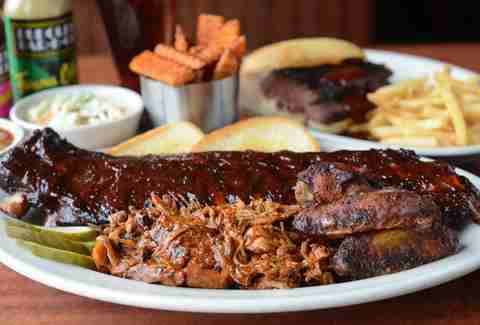 The ladies behind this South Minneapolis jewel know their ribs, and they know them well. 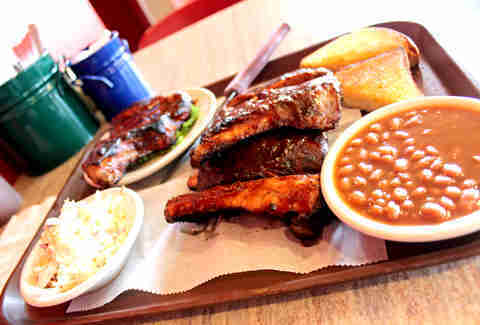 Meaty, juicy, sticky, sweet, smokey, and just a bit spicy, these ribs are truly a South side treasure! Also, they try to keep things local and organic whenever possible, which is another plus! 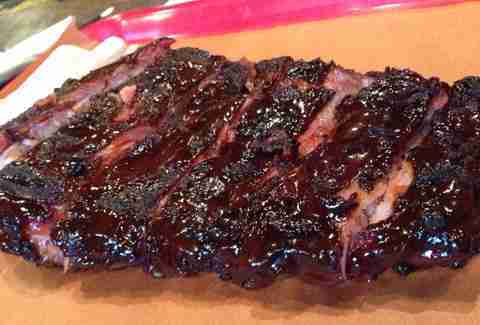 These monstrous fatties proved to be our personal favorites in this little rib rustle up, and once you give them a try, you’ll know why. Done with a rich, dry rub that adds all kinds of extra umami and depth to these bad boys, yet still leaves them incredibly moist and juicy on the inside. If your slogan is, “our meat is as tender as a mother’s love,” your food better be good (or people are gonna start saying bad things about your mother), and fortunately for the folks at this South Minneapolis BBQ spot, they can deliver the goods. 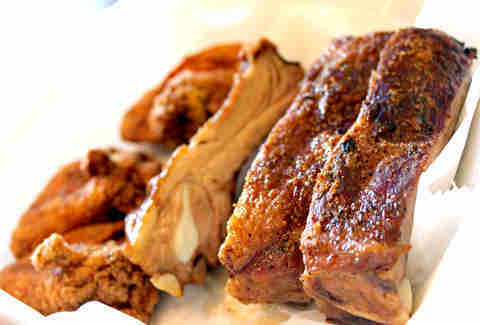 Their meaty ribs are easily some of the best and most tender around. The only downside is that it’s a to-go only spot and the journey home, filled with the rich smell of delicious BBQ, can be a bit painful.